Check our Upcoming Sale Information for the day and time. All registered consignors are welcome to bring their items anytime during the time scheduled for general Consignor Drop-off. All consignors should be in line no later than 30 minutes before the end of check-in time. 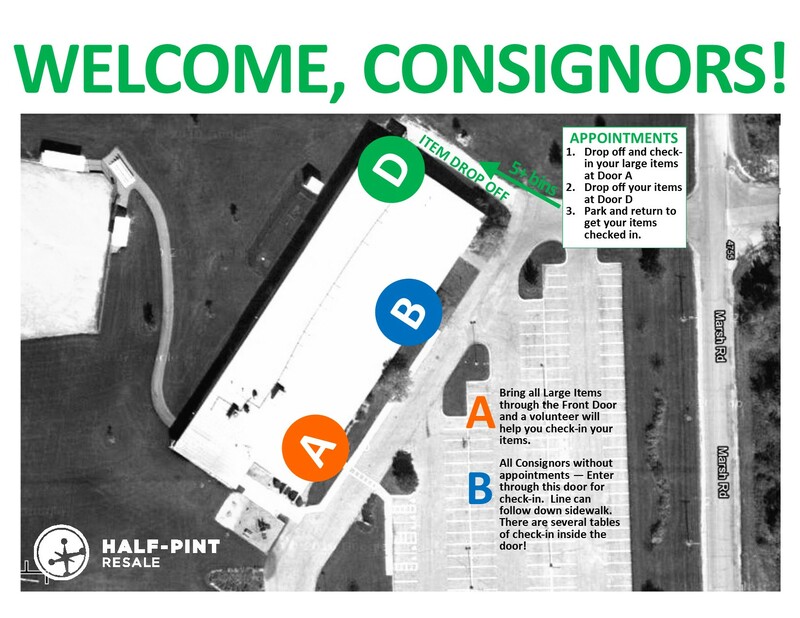 Consignors with 1-4 bins should expect to spend approximately an hour at Consignor Drop-Off. This time will vary completely on the length of the lines when you arrive and how many items people have. Consignors with 5+ ‘bins’ can sign up for a Drop-Off Appointment, however, if they are full or closed, you may also check your items in through the general Consignor Drop-Off lines (see below for more information). Typically the busiest time is at the beginning of Drop-off, but there are no guarantees! Last sale it was busiest over the lunch hour. If you have 1-4 bins/boxes of items or are not scheduled for a Drop-Off Appointment, the easiest system is to bring a dolly or cart with you and wheel your items up to the entrance. You may also drop items off onto the grass near the entrance and drop items there while you park. ALL GEAR GOES IN DOOR A and is CHECKED IN SEPARATELY BY A LARGE-ITEM VOLUNTEER. What is a large item? Nursery furniture, bouncers, big toys, pack and plays, high-chairs, safety gates, ride-on toys, bikes. If you’ve shopped the sale before, it’s all of that stuff that is right by the sale entrance. Don’t worry – if you bring your item to the wrong place, we’ll help you make sure it gets to the right area. The point of the special Large Item is to make it easier for you (no dragging big items with you in line) and easier for us (putting it on the floor approximately where it will end up post sale). If you are scheduled for a Drop-Off Appointment, you’ll be unloading your bins at the loading dock on the side of the building (Door D). A volunteer will give you a spot inside the building for you to store your items and a number that goes with that spot. You may need to wait for the person in front of you to finish for a volunteer to start checking in your items. You can either finish this process first, or you can go drop off your large items. All LARGE ITEMS will go in Door A and will be checked in separately by a large-item volunteer. LARGE ITEMS: All large items go in DOOR A. There will be a volunteer to help check those items in. They will check to make sure things work (batteries, etc.) and check for proper tagging. 1) You will be asked to confirm your consignor number. 2) The volunteer will then check your bin: You must have your consignor number on the outside of the bin and on the inside of the opposite side of the bin. If you do not do this, there is a chance that this will be written in permanent marker on your bin once your bin is at the sale. You should also have your name and phone number written on the bottom of the bin. Your bin MUST be plastic (not a cardboard box or bag) and you MAY NOT leave your lid. **If you do not plan to pick any items up post sale, then do not leave a bin! 3) If you are consigning more than 30 items, you will then be given your consignor pass which you will need to get into the consignor sale. 4) The volunteer(s) will then start to sort through your items. They will be checking to make sure all items meet the guidelines (Tags are fully filled out and filled out correctly, Items are hung correctly on the hangers, Items are not stained, out of season, out of date, recalled, or on our not-sellable list, and that any Gear tags are filled our correctly). Please be aware that during this process, some of your items are likely to be rejected. This even happens to us Every time! In order to keep the quality of the sale exceedingly high (thus bringing in lots of happy shoppers ready to spend money on your items!) we try very hard to be strict about items coming in. Thanks for understanding! 6) As the volunteer checks in the items, you can start putting your items on the sales floor. (Once all of your items are checked in, you may be asked to move your items to another location so that another consignor can be checked-in as you continue to hang your items on racks and put your items on tables.) There will be volunteers to assist you in finding the correct areas. For those of you who shopped or consigned last sale, the layout of the sales floor is usually similar. * When you are done, make sure you leave your bin IN THE BACK OF THE SALES FLOOR (near the breast pumps, and please, NO LIDS!) if you want unpurchased items returned to you, Also check that you have your consignor pass — and then you are free to go! BRING SOMETHING WITH WHEELS! Unless you have a smaller amount of items, bringing something to roll around the sales floor is helpful – a dolly, cart, wagon, rolling suitcase, etc. The floors are concrete, so you don’t have to worry about damaging the floor. There is, however, a few inch lip around the sale floor, which means you either have to be able to manage the dolly cart over that lip, OR unload off your cart when it’s time to put things onto the floor. Also note, there is no air conditioning or heat on the sales floor area. It can be kinda chilly or warm! Dress accordingly. Find the dates that you can register for drop-off scheduling here. It isn’t until you start sorting through your items that you know how much you have to sell. In the past, up to 50% of consignors who scheduled a spot early had to cancel, and many (many) people who wanted spots never got one because they were full. To sign up for DROP-OFF SCHEDULING, log in to the Consignor Portal (the same place you print barcodes). Please only schedule yourself for a slot if you KNOW that you need it. If you take a slot and don’t need it, and subsequently remove yourself towards the beginning of the sale, it causes issues for those looking for a slot. After the deadline, all scheduling is done manually and is hard for everyone involved to manage. Thank you for understanding! Drop Off Scheduling is only for people who are bringing 5 or more full bins/boxes/large bags of items (not including large items or partially filled bins)! If you bring less than this, you will be directed back to the general consignor lines to wait for a check-in and will not be eligible for Drop-Off Scheduling at future sales. Consignors are asked to not bring more than 8 bins of clothing (spring) or 10 bins (fall). Half-Pint organizers and volunteers have the right to turn away clothing for any reason, and especially watch for items that are out-of-date. They also will turn away items that exceed the maximum bin limit. The number of slots allotted for scheduled drop-off is determined based on traffic from past sales. If you find that none of the times available work for you, you are welcome to come whenever you like during the general drop-off hours and go through the regular lines/process! Each shift is scheduled for a half-hour, however, this time represents just the time you will spend with the volunteer who is checking-in your items, and the process may not start till 15 minutes into that time frame. After this process is complete, you will be responsible for putting your items out onto the sales floor, so please plan according. Also, please arrive at the beginning of your scheduled time as we will be doing our best to stay on time! If you arrive after your time-slot, you may be directed back to the general consignor lines. First time consigning and wondering if you are a 5+ bin consignor? You’ll know you might be a 5+ bin Consignor because you can’t (even with difficulty) bring all of your items in without a helper, a large wheeled cart, or a several load drop-off. Use your best judgement! If you aren’t sure, go ahead and plan to use go through the general lines. Note – if you register for a slot and do not show, you will not be allowed to register for a scheduled slot in the future. We appreciate your help! Thanks!